Jesus has turned up in a lot of unlikely places: a water damage stain, a pancake, a single Cheeto. But when we heard this morning that a couple had seen his face in their Walmart receipt, we thought, "Yeah, that makes sense." Apparently, the couple brought the receipt home and immediately threw it on the floor, like you do. 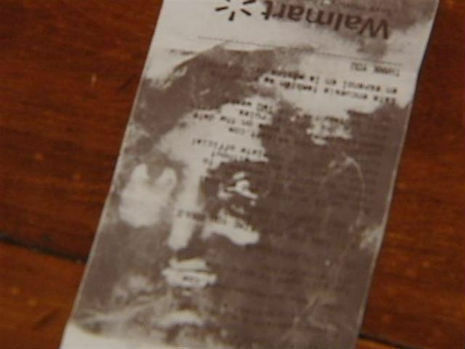 A few days later they noticed the receipt had developed a dark stain on it in the shape of someone's face. Now, we agree with our friends over at Dangerous Minds; if the stain looks like anyone, it's Harry Dean Stanton. But the owner's say that they are convinced the receipt bears the visage of their lord and savior. Finally, spiritual and financial savings all in one place. Walmart really can do it all. Check out the local news report below and let us know what you think about all of these Jesus sitings.